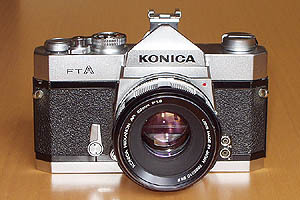 The Autoreflex T2 – in Japan sold as New FTA – was introduced to the market in 1970 as successor of the Autoreflex T (called FTA in Japan). 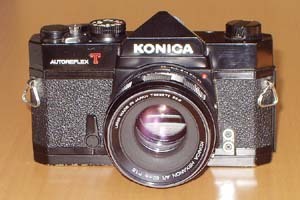 The changes over the predecessor are not too many, probably for this reason the Autoreflex T2 / New FTA continued to be marked as Autoreflex T or FTA, respectively. Therefore, both models quite often get confused and many Autoreflex T2 / New FTA are being offered as Autoreflex T / FTA. The Autoreflex T2 / New FTA is far more common than the Autoreflex T / FTA. You can see the differences between the models on the Autoreflex T / FTA versus T2 / New FTA comparison page. The Autoreflex T2 / New FTA was available in chrome-black and in black, the chrome-black version being much more common than the black one. Like all the predecessors and successors from the series of the big Autoreflex cameras, the Autoreflex T2 / New FTA is extremely sturdily built and takes abuse well. The Copal vertical travelling metal focal plane shutter works reliably and exactly even in very cold temperatures and after a long time of use. All in all a real workhorse, that is still usable and suitable for everyday use after more than 30 years. The Autoreflex T2 / New FTA is a full-featured SLR. Its automatic exposure control with shutter speed priority was a very advanced feature at this time, most cameras had match-needle metering only, back then. Further, the camera has a depth-of-field preview, a very informative and quite bright viewfinder, and a mirror lock-up function (with the self timer) as advantages. The Autoreflex T2 / New FTA had a mat screen with central microprism spot as standard equipment. A different mat screen with a central split-image indicator instead of the microprism spot was available as an option; this version is quite rare. The Autoreflex T2 / New FTA is, like all the big Autoreflex cameras, quite big and rather heavy – especially when compared to modern cameras. From today's point of view, a hot shoe for flash photography is missing, the flash operation via PC synch cable ist quite cumbersome for snapshooting – for demanding exposures the fitting of the flash on top of the camera is usually not the best position anyway. The Copal metal focal plane shutter is very noisy, the sound can be disturbing occasionally. If you can live with this, you will get an almost indestructable classic with the Autoreflex T2 / New FTA, that is still good for everyday photography. Like many other cameras from this era, the Autoreflex T2 / New FTA uses mercury oxyde batteries for the light meter (2x type PX675). These batteries are not manufactured any more for environmental reasons and become more and more difficult to get. The usage of silver oxyde or alkaline batteries of the same size (SR44 or LR44, respectively) causes wrong meter readings, because these batteries have different voltages. There are several possibilities to fix this problem. You can find more information on the subject of mercury oxyde batteries if you follow the link. A detailed overview over technical data and features you'll find here. The Autoreflex T2 / New FTA was replaced 1973 by the strongly modified and improved Autoreflex T3. Some controls have been changed: the shutter release is smoother and has a significantly shorter travel, thus reducing the danger of camera shake. The on/off switch for the light meter is positioned around the shutter release button and no longer on the back of the camera body below the rewind crank. With the Autoreflex T2 / New FTA, it serves as shutter release lock simultaneously. The frame counter has been changed for better readability. The Override switch of the Autoreflex T / FTA is no longer present, shutter speeds outside the coupled range of the light meter can now be chosen without having to pull a lever. 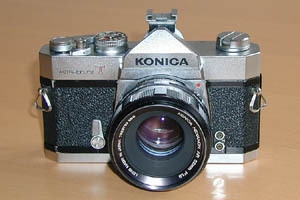 The shutter speed set on the body is shown in the viewfinder with the Autoreflex T2 / New FTA.